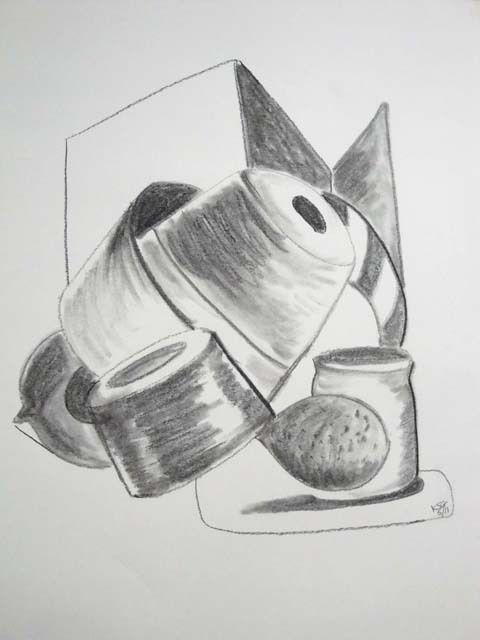 Pile of Pots: Drawing by Karen G.
Karen is one of the two students who followed my direction about this still life: Plan on doing two drawings. In the first, study the shapes and produce a representational drawing. In the second, take off and play with form, with a deliberate departure from representation. 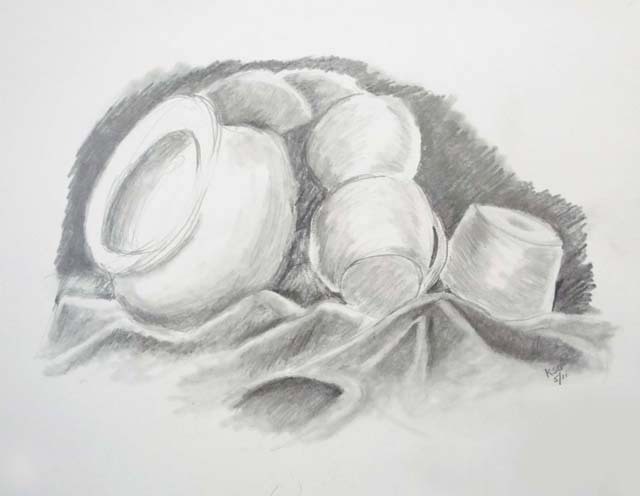 In her second drawing (above) she inverted some of the pots, took the pear that rested on top of the pots and put it on the bottom of her drawing and invented forms that were not in the still life at all. The angular shapes on top may have been inspired by the corner of the room or the angle of the door. The striped crescent is pure invention, for the sake of the composition. The drawing is explosive and dense at the same time. It’s a work of conviction and playfulness. These are—intellectually—contradictory terms, but in a work of art they co-exist because in art we reconcile contradictions; we get at the whole ball o’ wax, also known as the human condition. This post is the last in the series about drawings made in one three-hour session by seven students. To follow the discussion of this still life, see posts for May 22, 23, and 24; and June 5,6, and 12.